Astonishing X-Men Annual #1 review – AiPT! The original X-Men are back together, and that freaky new version of Charles Xavier is crashing the party! Wow. Now this is a classic X-Men story. And look, it features the classic X-Men: Archangel, Beast, Iceman and Jean Grey. No Cyclops, though (anyone know what happened to that guy?). No disrespect to Cullen Bunn, of course, as his X-Men Blue series has featured many amazing moments. But the time-displaced original five just can’t compare to the real thing. But was there ever any doubt Astonishing X-Men Annual #1 wouldn’t be a good read? After all, it’s written by Matthew Rosenberg who, since Astonishing X-Men #13, has really made sure this series lives up to its name. Maybe I’m just floored that I loved a Marvel annual. I’m old enough to remember a time when these oversized issues were just a bunch of throwaway stories by fill-in creators. If you’re unfamiliar with X (or just confused with what exactly his deal is), he was the end result of writer Charles Soule’s Astonishing run. Basically, he’s Professor Charles Xavier’s mind in Fantomex’s body… and he makes some pretty morally questionable decisions. Are you still following along? If not, don’t worry–it’s X-Men, you’ll catch up (or not). This comic acts very much the same way as Tom Taylor and Pascal Alixie’s excellent X-Men Red Annual #1, which helped fill in the storytelling gaps immediately following Jean’s rebirth in Phoenix Resurrection: The Return of Jean Grey #5. The former Phoenix has assembled the original team for… a reunion dinner! That is, until their meal is interrupted by an uneXpected guest… do you get it? Do you see who I’m talking about? Yeah, it’s X! The dialogue in this opening scene (and really, throughout the entire issue) highlights Rosenberg’s talent for nailing these timeless characters’ voices. You feel for a Jean who’s returned to a world without her husband and a sense of purpose. You understand Warren’s desire to stay in control so he can suppress the darkness within him. You laugh along with Bobby, the group’s eternally lovable younger brother. And Hank, my God, it’s so refreshing to follow a Beast that you don’t want to strangle. These are weathered mutants who have seen it all and are at a low-point in their superhero careers. And then X strolls in and makes everything even worse. At first, I didn’t know what to make of X. But after reading this annual, I see his amazing character potential. I know Xavier became a bit of a jerk before he “died,” but X is truly an Xavier who just doesn’t care what you think. He leaves a trail of confusion everywhere he goes and, again, he just doesn’t care. How does X have a new mansion when the X-Men control his estate? Why did he have a change of clothes for Jean in his mansion? Is he really going to finish that bottle of liquor before he helps people in need? 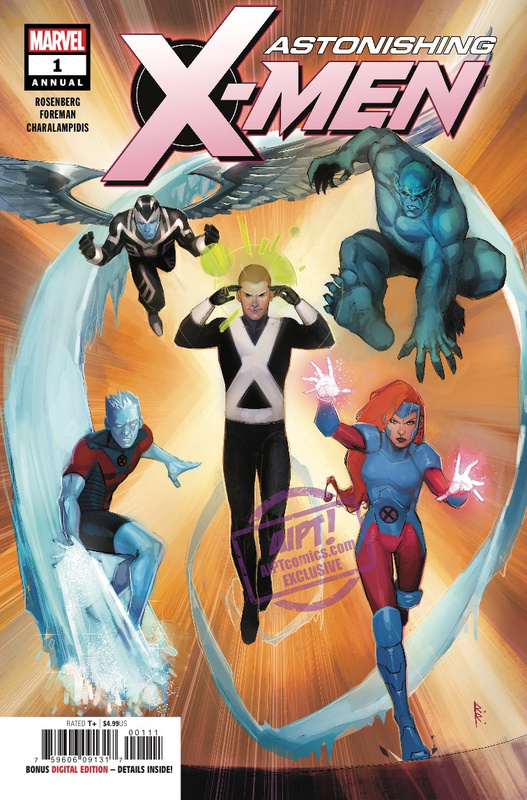 And most importantly, as Iceman points out, why does X have hair? While I always enjoy Rosenberg’s use of humor in his comics (which we had a chance to discuss in my recent FAN EXPO Boston interview with the creator), what I loved most about this annual is how the X-Men felt like a group of dear friends. After so many Civil Wars and Schisms, it’s just so refreshing to see heroes caring for their fellow heroes–even when they do something shocking, which occurs later in this issue. Of the modern artists currently working in superhero comics, Foreman definitely has one of the most unique styles. I think it’s wonderful and really helps this one-off adventure stand out on its own. At first glance, these panels appear clean and simple, but upon closer investigation, have incredible detail–from Beast’s fur to Archangel’s wings. And the facial expressions! Believe me, this art will make you want to see a series featuring the smug X rendered by Foreman. I really have nothing bad to say about this story, even if the ending will leave you furious (like all the best comics). Maybe it could have been even better if adult Scott Summers was in the mix, but that guys gone for good, right? What’s uncanny (ha), is I finished this comic with very much the same thought I had at the end of Ed Brisson’s Extermination #1. And that’s that I’m so excited for the future of the X-Men with Brisson and Rosenberg co-writing the franchise’s flagship title alongside Kelly Thompson. If upcoming stories are as strong as Astonishing X-Men Annual #1 and Extermination #1, then the X-Men should have no problem regaining their dominance on the sales charts. The surviving original X-Men are finally reunited but it's the mysterious X who steals the show in this terrific annual! Matthew Rosenberg masterfully captures the family dynamic at the core of the X-Men. Travel Foreman's unique art gives annual featuring 55-year-old characters a modern feel. Wonderful humor, an intriguing mystery and a shock ending--what more can you want from an X-Men story? Insert whiny complaint about Cyclops being dead here.